Teaching Children with Special Needs: Look What's New! Hello! My name is Calista White, and I am part of the marketing team for Achievement Products. There is an exciting change for us that I want to share. Just this week at Achievement Products, we unveiled our new website! It has new features designed to assist both professionals and parents who are part of the special needs community that serves children. A feature we are very excited about is the new Special Needs Calendar Topics. It features dates for national health observances that help raise awareness of important special needs topics, such as Cerebral Palsy Awareness Month and National Nutrition Month, both of which are coming up in March. Be sure to check our calendar for new updates regularly! Because we know how many children are affected by autism, we wanted to provide a special focus in our Autism Support section. We feature selected products that may assist with the difficulties most often experienced by children with autism. Check out our exclusive Weighted Pressure Vests (AP90050) or sensory Moon Launch pad (AP92173) or find more products on the Autism Support page. For therapists or educators who work at multiple locations, explore our selection of portable therapy session solutions, which include our exclusive Progressive Therapy Sets (AP79601, AP79602) that were designed by our Therapist Consultant and include 30 minute session guides, the On-the-Go Swing (AP81111) and the Puttycise® Putty Tools (AP10282). All items in our “Therapy To Go!” section are easily portable as well as easy to set up and use in different environments. Each of these is a new product for us and for the special needs market and we are so excited to be able to share it them with you! Follow us on Facebook – just click here! 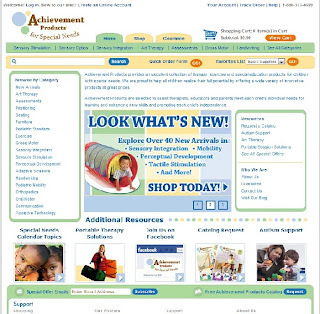 We hope you’ll visit Achievement Products frequently for new products, information, and more! Special Offers from Discount School Supply! Get Your Classroom Ready for Cold & Flu Season! Our New Brand Excellerations™ Launches for 2013!